I find your site to be very interesting and informative, but I still cannot find the proper resource for information about a pice of jewelry that I have acquired. 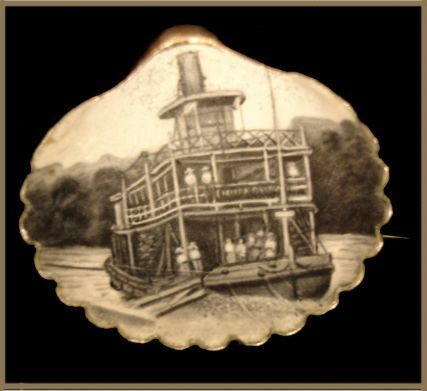 It is a tiny metal shell shaped pin (1") with a painting of what appears to be a small steamboat on the inside. I think it is quite old, and although I am far from being an expert, I would guess it is from late 1800 - early 1900 ?? I have been attacking this mystery from every angle: miniature paintings, jewelry, steamboat history . . . Robert Fulton was a painter of miniature portraits and landscapes, and a jeweler, as well as the creator of the first commercial steamboat. All these interests are in this one tiny piece. Wouldn't it be a thrill to find that this was made by his hand. Could you possibly send me in the right current toward learning more about the vessel depicted or the artist? I would be most appreciative.